CoLab Radio » Blog Archive » What can public agencies gain from collaboration? 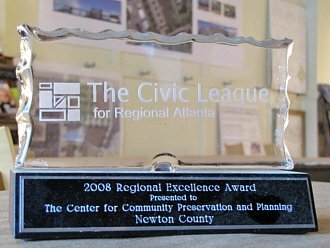 While development pressure increased in the early 2000s, each public agency and municipality in Newton County felt it in different ways. Though communication across groups had traditionally been difficult, the county’s elected and appointed leadership came to realize that working together was the only way to shape their future. How did the county’s leaders go from rarely speaking to each other to meeting regularly as the Leadership Collaborative? It all started with an opportunity for discussion. Once the path was cleared for discussion, leaders were surprised by how much they could gain from listening to each other. “The idea was tossed around [in the early 2000s] about how to plan for the future of Newton County. My high school classmate, Rob Fowler, is a very forward thinking businessman… He had a building available, and some financial resources available, and that’s how the Center for Community Preservation and Planning started. Since I was Commissioner for District 1, we became the guinea pig for the program. The first meeting of any group was the District 1 people: me, the Newton County water and sewer person for District 1, a person representing the hospital who lives in District 1, the District 1 school board member, the tax assessor for District 1, and there seems like there may have been one other person. How has this collaboration helped its various stakeholder agencies? The wide availability of county water lines drove large, 100+ home subdivisions further and further into the rural county. The availability of adequate water service was not a consideration in rezoning or permit approval process, and eventually, during the summer of 2003, the demand for water grew larger than the existing pipe size could accommodate, and water outages struck. Accordingly, the Newton County Water and Sewerage Authority was one of the earliest advocates for discussion of growth management. The decision to restrict future development to compact communities will save a considerable amount of money and construction for the water and sewer authority. Now the challenge remains to enforce those land use decisions, and encourage future developers, who may be accustomed to easy variances, to work within Newton County’s system. Finding an affordable location for new schools is a challenge for any school system. The State of Georgia prohibits school systems from acquiring land for new construction until the existing student population demands it. In fast growing Newton County, new schools opened with outdoor trailer classrooms. “Alcovy High School was located on Highway 36 because it was the cheapest land the school system could afford to buy. But the school system found they were so far out, the school is 13 miles south of the City, and they have to transport so many students from so many different areas, that that is the most expensive bus transportation system of any school in the county. The mayors and many councilmembers of the five municipalities in Newton County now meet regularly to discuss shared opportunities. In 2008, every entity in the county, including the cities, adopted the same fiscal calendar. Today they even share a fuel depot, negotiating as one entity for better prices. “Years and years ago, if you went to talk to a County Commissioner, you went to their office, and it was like you were a kid in school going to the principal’s office. You shouldn’t, and it’s not that way at all, but it kind of felt that way. And now you come here, and it’s neutral ground, and we’re all equal. It doesn’t matter how big the city is or how small the city is. Porterdale is a small city, we’re larger than Mansfield and Newborn, but we’re all equal. The county administration has adopted the approaches developed in the Leadership Collaborative to improve its internal and external function. New permitting software, clearer administrative responsibilities, stronger communications with other agencies – all of these improvements have made the County more efficient and better able to function during the recession. Homes in sprawling subdivisions, scattered across the countryside, are more difficult for emergency services to reach. The cost of fire protection, as well as other public services, like garbage collection, is considerably lower per person in denser residential areas. The growth of new homes vastly outpaced the growth of new jobs, but the collaboration presented a new means for everyone to work together on the common goal of economic development. The Leadership Collaborative sees not only the need for attractive office and retail space, but also the importance of an educated workforce. Through a united front, the County attracted a new campus of Georgia Perimeter College and helped the campus locate within one of the county’s planned compact communities.